3rd and 5th-graders at Milbridge Elementary School know all about “phenology” and the living things they can find in their local ecosystem--do you? Due to a lovely partnership with Cobscook Community Learning Center’s Transforming Rural Experience in Education (TREE) program, Maine Outdoor School has been able to provide weekly one-hour outdoor programs to the 3rd and 5th-graders at Milbridge Elementary School. One of TREE’s important focus areas is to listen to local students and help weave their voices into the academic goals of their classrooms--outdoor learning opportunities have been just one method of addressing these students’ and teachers’ needs and hopes. Both the 3rd and 5th-graders are using journals to illustrate and write their own mini-field guides to the living things they find around the school. The 3rd-graders are connecting those efforts to survival adaptations in different species--including in humans, through connecting what they discover to the Island Readers and Writers’ book Lost Trail: Nine Days Alone in the Wilderness by Donn Fendler, which they are reading in class. The 5th-graders are connecting their journals to their classroom science and language arts curricula. They have not only identified and journaled about plants, but they were also challenged to find examples of the vascular and non-vascular plants to solidify that particular science unit goal. 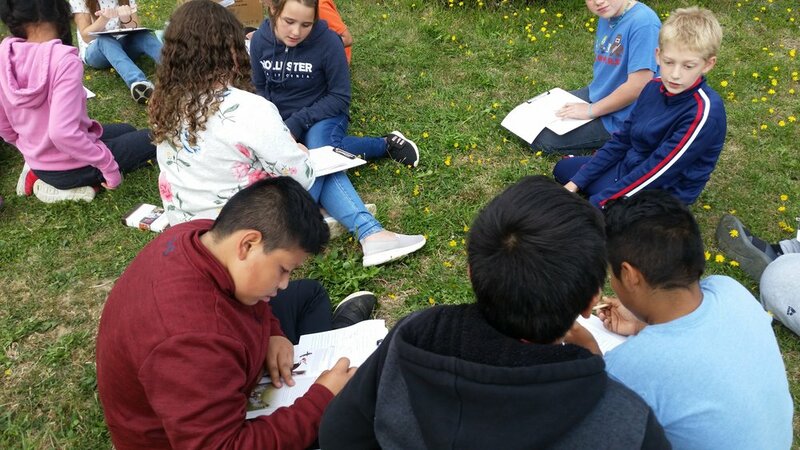 While this program is far from over, students have so far identified and classified a diversity of living things, figured out what living things need to survive, learned about how plants adapt to living in wet, dry, and cold conditions, and shared their learning with a student in a different grade. Stay tuned through our social media, e-newsletter, and our website to learn about what else these students discover during their weekly Thursday Forays! To learn about our other collaborations with TREE, check out our shelter-building program from May 2018 here and our Forest Fridays at Jonesport Elementary School here.